When hunting mammoth it was about driving it in. Not throwing it. That's why Clovis spears were socketed. Drive one in, reload, drive another in until it bled out or you hit a vital point. When you say...drive one in...I am envisioning not hunting but self defense, close up and personal. Can you elaborate on that please. Your literally running up and jamming the spear in and quickly letting go. or pulling the mainshaft out. Looking at the date for this find they could of used a atlatl to propel the spear. A properly weighted and balanced atlatl would give you some power. Mammoth hunter spear shafts were stouter, with socketed spear points attached and launched with a spear-thrower. When they struck their target, the shaft would rebound, leaving the point embedded. They could be quickly snatched up and reloaded and reused on the same target. Just scatter the floor with Lego. One step on that and they're down like a ton of bricks. A rounded metal slug wouldn't have the penetrating ability of something sharp. 10 gauge black powder shotguns weren't all that powerful either. You could catch a slug in a leather jacket. Your describing a Webb Phase atlatl. Mammoths were extinct by the time of it's development in North America and the European (Solutrean) atlatls didn't use socketed spears. There's a Webb Phase atlatl on my Facebook museum reproduction page that I use to put foreshafts through car doors. Since the atlatl is a one handed weapon and can be used from a boat or canoe, it is thought that it may have originated with coastal or maritime archaic peoples and the compound dart or spear was used extensively. What may have been forshafts of atlatl darts have been found at Clovis sites and Clovis man most certainly hunted mammoths. The population that replaced them after the Lesser Dryas extinction event, of course did not. Since the atlatl is a one handed weapon and can be used from a boat or canoe, it is thought that it may have originated with coastal or maritime archaic peoples and the compound dart or spear was used extensively. 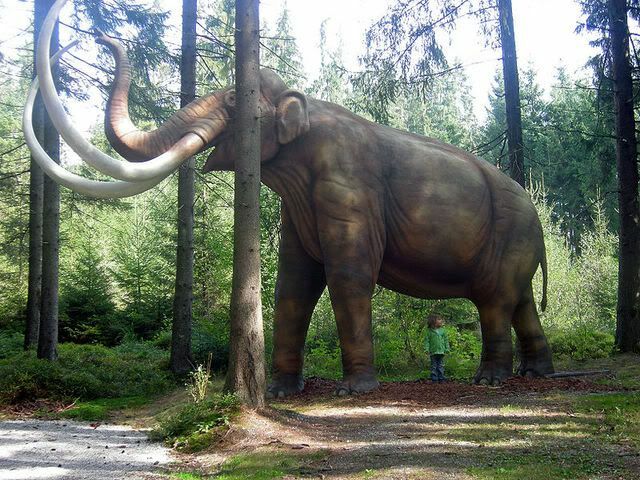 What may have been forshafts of atlatl darts have been found at Clovis sites and Clovis man most certainly hunted mammoths. I've handled many of those Clovis bone foreshafts myself. They were too big for anything but a 'ramming lance" like what was used by later buffalo hunters. The population that replaced them after the Lesser Dryas extinction event, of course did not. It was the same population, They just adopted a different technology. More than one wave of migration colonized the Americas. The ones I was talking about weren't of bone. I'll cite you some references when I get home. These were identified as possible atlatl forshafts. I'm thinking 4 waves. One Maritime. One land bridge. Two on boats across the strait. This really shouldn't surprise anyone. The mammoth was meat. People eat meat. I'm sure different folks tried many different ways to kill them. If myself or my family were hungry, I imagine I would attempt to drive a spear into a mammoth, assuming I could get close enough to one. i wouldn't be confident I could kill it, but I would sure try. Now I don't think this find means that this was the typical, most effective and most common means of killing a mammoth. Is it possible that they hunted mammoths in the same way that the Pygmy hunters in the Congo do just thought I would bring it up as it would seem that the size of the hunter is not that significant if they know what they are doing? As you see by the rather vivid mockup of a mammoth, the idea of running up and thrusting a spear into it would have been well nigh impossible, except for the legs. Atlatls were definitely used with or without compound darts. This bears repeating. Atlatls were a revolution in their own right. More kinetic energy than a arrow, farther distance than a thrown spear, and deadly accurate. The atlatls also saved lives by allowing hunters to kill at a distance instead of risking trampling by shoving a spear through the hide. Narrowed tips penetrated better and deeper. That's a brave hunter. Gutsy. Yes, but then that has been their environment forever so likely guts, glory and steaks make it worthwhile. Many of us take similar risks in our daily lives just in different ways. I bet he got his choice of the ladies during the celebration. That's evolution at work. It also helps when your packing an iron spear blade thats razor sharp. Early ancestors only had flint, chert, and obsidian. While razor sharp in their own right, these were still way inferior to iron.